The first quilt seeing some background action this week is the Rose Star quilt. I cut up the first half yard of fabric that I ordered into hexagons and hexagon thirds. Then I pieced them into these little shapes that I'm calling sprockets. The other quilt in need of some background action is my Summer Sampler Series quilt top that I made last year. I made the blocks all from Terrain fabrics. I have one of the four giant background/border pieces put on, but I still need to cut and attach the other two. I couldn't find ten yards of a single Terrain print for the back, so I bought fabric from another line to be the quilt back. Mr. Pins didn't feel like it as much, which means we're now back to square one on the quilt back situation. I'm thinking of piecing something out of Terrain prints that I can get my hands on, or Mr. Pins likes this Beatrice Weave print in Raspberry. 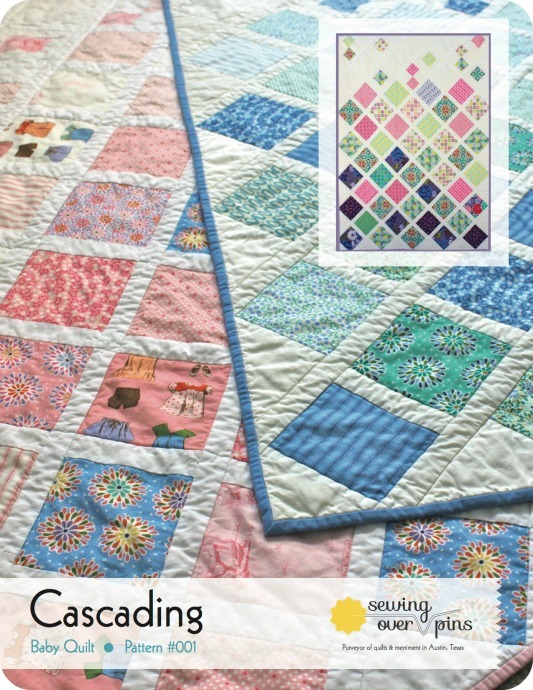 Also, the Cascading quilt pattern got a little refresh today. If you purchased it on Craftsy, you'll be getting an update email to let you know that it was changed. The content is still the same, but it has the current logo throughout as well as a nicer cover. The Marine Den pattern is coming on Friday, so get pumped! That's what's goin' on in The Clubhouse. I can't wait to see what ya'll are working on! you are putting me to shame with your speedy background sewing! Quick question, what are you going to do with the edges? Are you just going to trim them when you are done? Everything pops so perfectly on that gray. Such a good choice! I'm loving the color you picked for the background of your rose star quilt. It is really making those blocks pop! Wait! I just gained 10lbs from all the yumminess here!